There were clear views of the delta today (October 6), with only weak plumes being produced by the few ocean entries. 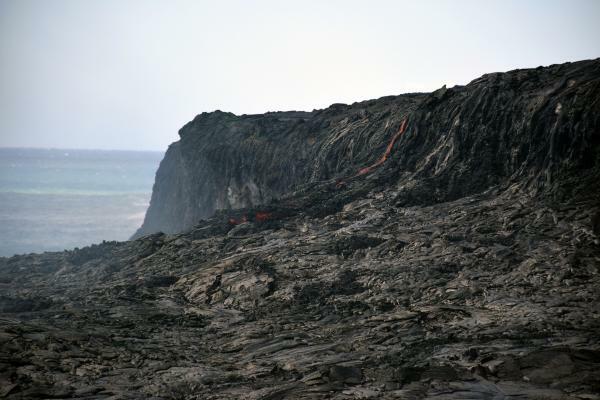 Multiple pāhoehoe streams and drips entered the ocean on the east side of the delta (pictured). Over the past two weeks, there have been at least three breakouts within 100 m (330 ft) of the Kamokuna ocean entry. The western-most breakout (pictured above) had no visible surface breakouts on the cliff today (October 6), but was producing a nice cascading ‘a‘ā flow off the edge of the cliff and onto the delta. These lava cascades have been occurring often starting on October 1 just after 10:00 pm (HST), and consisted of both ‘a‘ā and pāhoehoe flows onto the delta. There was a weak plume originating from several lava entry points on the delta today, visible on the right side of the photo. 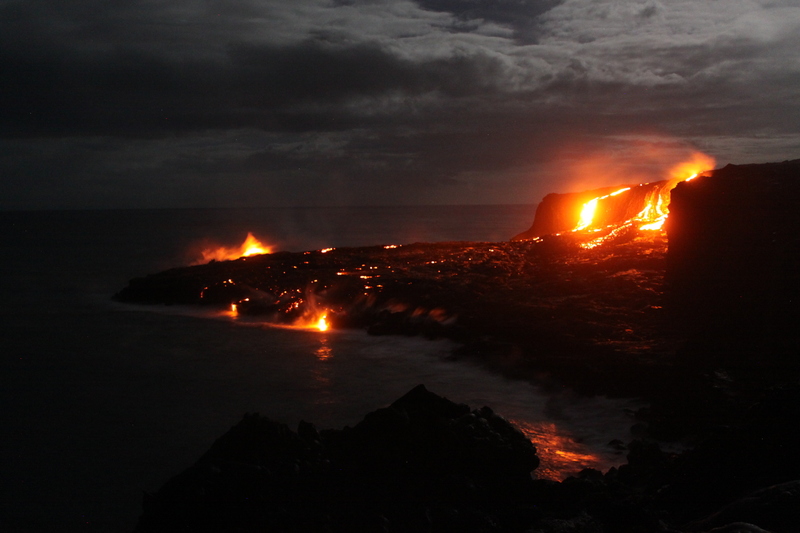 Time-lapse image of multiple lava cascades on the sea cliff on October 4 at 3:31 am (HST). Just a few of the many resulting surface flows can be seen on the delta both below the cliff and near the front, which is lit by lava and moonlight. 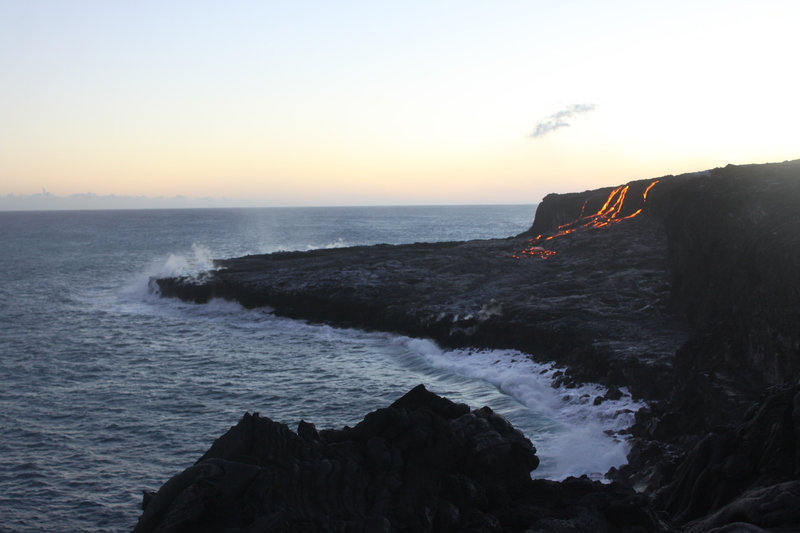 Time-lapse image taken on October 5 at 6:11 pm (HST), with the lava streams showing up nicely as the sun starts to go down. A small channel flowing down the cliff to the delta creates an ‘a‘ā fan at its distal tip. Many lava falls over the past week have locally built up the height of the sea cliff and covered much of the blocky rigid cliff face. is just visible abutting the littoral cone. Commentary – Were Pahoa High and Intermediate Lunch Times Shortened Because of a Fight? Yesterday, KHON2 News ran a news story about Pahoa’s lunches being shortened. …Changes to the lunch program at a Hawaii island school prompted parents to reach out to us, saying their kids are being rushed to eat. Their kids go to Pahoa High and Intermediate School, which recently started a pilot lunch program. Aloha Damon, I wanted to bring something to your attention that maybe you could do some investigative reporting. Apparently Pahoa High and Intermediate administration has decided to have Intermediate student only eat lunch during first recess which is 15 minutes while the high school eats during regular lunch which is 30 minutes. When I complained to the principal she stated it was due to decreasing tardys to class during lunch time. An insider told me they did it because of a fight that occurred between a Intermediate kid and a high schooler. “This was what they call Baja fish taco SMH. This was on Wednesday when we went to school for student of the month luncheon I was In Shock when he came to the table with this…Home lunches from now on!! !” said Valerie Walsh. Got Baja Fish Taco? I don’t know if I could swallow this in 15 minutes… less yet an hour!!! Attorney General Doug Chin today joined a coalition of 18 attorneys general warning the Trump administration that it should expect legal action over its discriminatory, ill-considered, and dangerous move to effectively end the contraception coverage rule created by the Affordable Care Act. The 18 attorneys general have written Acting Secretary of Health and Human Services Don Wright, Secretary of Labor R. Alexander Acosta, and Secretary of Treasury Steven Mnuchin expressing their strong opposition to the Trump administration’s action that will increase healthcare costs for women, lead to more unplanned pregnancies, and place even more strain on state budgets. University of Hawaiʻi at Mānoa Football Offensive Line Coach Chris Naeole and the university have decided to part ways, UH Athletic Director David Matlin announced today. Athletics Director Matlin says Naeole has had a tremendous impact on the program. Naeole spent the last four-plus years on the UH football staff, three under former head coach Norm Chow and the last one-plus under Rolovich. He also served as interim head coach after Chow’s departure. Hawaii Electric Light reports that about 2,000 customers in North Kohala experienced a power outage last night. The outage occurred at 7:44 p.m. and service was restored at 9:58 p.m. The area was experiencing strong winds at the time the outage occurred. Hawaii Electric Light thanks the North Kohala community for its patience and understanding while crews worked to safely restore service to the area. Outage information is suppose to be posted on the company’s Twitter account @HIElectricLight with the hashtag #BigIslandOutage. To report a power outage or downed line, customers may call the company’s Trouble Desk at 969-6666. Senator Mazie K. Hirono today announced that two Hawaii businesses will receive $1.5 million in U.S. Department of Energy (DOE) funding to develop offshore seaweed as a potential clean energy source. The funding was awarded through DOE’s Advanced Research Projects Agency–Energy (ARPA-E) program. Under the grant, Kampachi Farms in Kailua-Kona received $500,000 to develop an offshore seaweed production farm and test harvesting techniques for future use in renewable energy production. In addition, Makai Ocean Engineering in Honolulu will receive $995,978 to create a model that simulates the ocean to help researchers determine the proper design and estimate costs of offshore seaweed farming systems. Senator Hirono continues to advocate for ARPA-E funding. Earlier this year, she wrote a letter to the Senate Appropriations Committee urging for continued funding for ARPA-E after the President threatened to slash the program by $20 million in an effort to wind it down. The Hilo Adult Day Center, a joint venture between Hawaii Island Adult Care, Inc. (HIAC) and Hawaii Island Community Development Corporation (HICDC), was awarded $2,340,000 by The Harry & Jeanette Weinberg Foundation, Inc. The Weinberg Foundation has so far funded $1,775,000 and the final $565,000 payment will be made at the completion of the project. Hilo Adult Day Center’s new building, located on Mohouli Street and above Komohana Street, will feature large open spaces for art/craft activities and physical fitness geared to elders along with quiet indoor spaces for reading, socializing and relaxing. Project features include a fully certified kitchen to provide hot meals, outdoor gardens and a meandering path. The project is currently under construction by Isemoto Construction Corporation and is roughly 50% complete. Construction is expected to be completed in February 2018. The Harry & Jeanette Weinberg Adult Day Center will complement Hawaii Island Community Development Corp’s existing and planned senior housing in the Mohouli Senior complex with its 182 units at full build out. The first phase of 60 senior housing units was completed in 2014, the second phase with 30 units is nearing completion this month and funding for the last increment of 92 units has been secured from the State Housing Finance and Development Corporation. The total budget for the Adult Day Center project is $8,586,000. While the building will be completed early next year, the parent organization, Hawaii Island Adult Care will still require an additional $580,000 to pay for furniture, fixtures and equipment including a commercial kitchen that will provide meals for the seniors. To date, in addition to The Harry & Jeanette Weinberg Foundation, project donors include community and board members, County of Hawaii, State of Hawaii, Cooke Foundation, HEI Charitable Foundation, LGA Family Foundation, Matson Foundation, KTA Super Stores, Bank of Hawaii and the Atherton Family Foundation. For information on how to donate to the capital campaign contact the Hawaii Island Adult Care Executive Director Paula Uusitalo at (808) 961-3747, ext. 105 or Keith Kato, Executive Director of the Hawaii Island Community Development Corporation at (808) 319-2422 or visit www.hawaiiislandadultcare.org. As part of Gov. David Y. Ige proclaiming October 2017 “Cyber Security Awareness Month,” the Hawaii Department of Defense Office of Homeland Security, in partnership with the Hawaii State Public Library System and local nonprofit Cyber Hui, will be offering cyber safety public awareness sessions led by cyber professionals throughout the month. The community-focused sessions will be held at local public libraries, shopping centers, and other locations statewide. Presentations will provide basic cyber best practices, also known as cyber hygiene. The range of topics will include malware protection, passwords, wifi usage, online shopping and banking, scams, safe email habits, phishing, data backup, and social media. Most sessions are scheduled to run approximately one hour and include an informal question and answer portion. The schedule of sessions is available at the state Office of Homeland Security’s newly launched Cyber Awareness website (ohs.hawaii.gov/cyber), which will also offer additional information to assist in awareness and understanding of cyber issues faced by the local community. The website will provide cyber safety tips, information resources, information on other events and announcements, awareness training/education, community engagements and other cyber-related areas. Gov. Ige proclaimed Cyber Security Awareness Month in Hawaii on Oct. 4 in recognition of the state’s role in identifying, protecting its citizens from, and responding to cyber threats that may have significant impact to individual and collective security and privacy. In July 2017, Hawaii joined a multi-state cybersecurity compact signed by thirty-eight governors to enhance state cybersecurity and develop the cyber workforce; the “Compact to Improve State Cybersecurity” is part of the National Governors Association’s “Meet the Threat: States Confront the Cyber Challenge” initiative and makes recommendations to better secure states’ cyber infrastructure by building cybersecurity governance, preparing and defending the state from cybersecurity events, and growing the nation’s cybersecurity workforce. “The State of Hawaii has already taken proactive steps toward the compact’s goals, including establishing a state chief information security officer, reclassifying IT security positions to align with modern industry best practices, offering cyber internship opportunities, and implementing a state workforce awareness program,” said state Chief Information Officer Todd Nacapuy, who leads the Office of Enterprise Technology Services, the agency responsible for securing state government information resources and infrastructure. Cyber Security Awareness Month in Hawaii coincides with the national observance, recognized by the U.S. Department of Homeland Security (www.dhs.gov/cyber), the Multi-State Information Sharing and Analysis Center (www.cisecurity.org/ms-isac), and industry partners which collectively encourage all citizens to learn about cybersecurity to put that knowledge into practice in their homes, schools, workplaces, and businesses. The Stop.Think.Connect.™ campaign serves as the national cybersecurity public awareness campaign, implemented through a coalition of private companies, nonprofit and government organizations, as well as academic institutions working together to increase the understanding of cyber threats and empowering the American public to be safer and more secure online. Customers submitting new applications to install private rooftop solar can now complete the process entirely online using a new tool launched by the Hawaiian Electric Companies. The Customer Interconnection Tool (CIT) is believed to be the first of its kind to provide a seamless, start-to-finish online solar application process that allows customers of Hawaiian Electric, Maui Electric and Hawaii Electric Light to check the status of their applications. The tool provides a user-friendly interface to guide contractors and customers through all steps of the Customer Self-Supply program application process, from submittal to finalizing the agreement. CIT allows applicants to submit all of their information, including electronic documents, online. For convenience, customers and their designated representatives will have the ability to submit electronic signatures as well. Applicants are prompted to provide required documentation, reducing the potential for delays caused by errors of omission. The tool also automatically calculates the system size based on four design guidelines, which simplifies the procedure. Customers will receive regular status updates by email as various milestones are reached, keeping them informed every step of the way. October 12, between 10 a.m. and 3 p.m., to shuttle fencing material and equipment from ‘Ōla‘a Tract to Wright Road in Volcano. October 14 and 15, between 9 a.m. and noon, to transport crew from Kīlauea helipad to Kahuku Unit at the 8,000-ft. elevation for archeological surveys. October 18, between 7 a.m. and 10 a.m., for ungulate surveys and control work in Kahuku between 5,000- and 7,000-ft. elevation. October 18, between 10 a.m. and 3p.m., to shuttle fencing material and equipment to Kahuku at about 7,000-ft. elevationfor silversword recovery efforts. October 19, between 6:30 a.m. and 8:30 a.m.,for ungulate surveys and control work in Kahuku between 3,000- and 5,000-ft. elevation. October 24, between 7 a.m. and 9a.m., to shuttle fencing material and equipment to Kahuku between 2,000-and 3,000-ft.elevation. 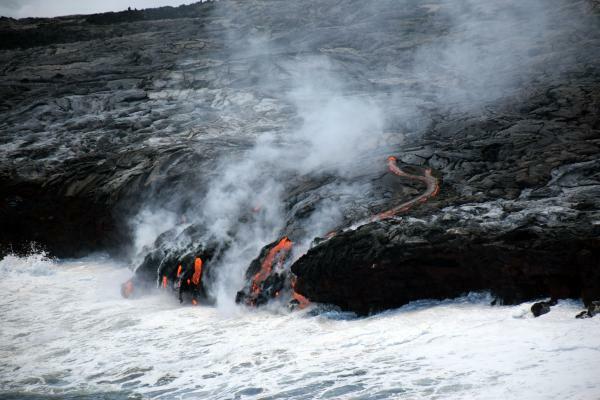 In addition, the USGS Hawaiian Volcano Observatory may conduct flight operations over Kīlauea and Mauna Loa to assess volcanic activity and maintain instrumentation. The park regrets any noise impact to residents and park visitors. Dates and times are subject to change based on aircraft availability and weather. Management of the park requires the use of aircraft to monitor and research volcanic activity, conduct search-and-rescue missions and law enforcement operations, support management of natural and cultural resources, and to maintain backcountry facilities. The Coast Guard, Ocean Safety and Lifeguard Services, Hawai’i County Fire and up to 60 event emergency responders on surfboards will establish a response zone around the swim course to manage the spectators, boating traffic, and safety of all race participants for the 2017 Ironman World Championship practice and official race in the vicinity of Kailua-Kona on the Big Island of Hawai’i Oct. 7 and 14. The Coast Guard Cutter Galveston Island (WPB 1349), two response boats from the Maritime Safety and Security Team Honolulu, and an MH-65 Dolphin crew from Air Station Barbers Point are involved in addition to the HCF rescue boat, OSLS jet skis and lifeguards and event emergency responders. The swim race will begin at 6:25 a.m. on both the ho’ala training swim and official race days. Mariners in the area should maintain heightened awareness of swimmers, surfers and paddle boarders. Overloaded vessels, boaters operating negligently, and flotillas operating in the vicinity the official swim course, starting ashore at Palani Road and extending 2.4 miles offshore, will be contacted and returned to shore. Coast Guard crews will provide a law enforcement presence in the area throughout the week and conduct recreational boating safety outreach. For more information contact the 14th District Public Affairs Office at 808-535-3230.